You will need to arrive on the day before (Tuesday) and spend the night in Fairbanks. Be very careful about your flight arrival date because many flights arrive into Fairbanks just after midnight. I recommend that you depart any time on the 25th (Wednesday) unless you plan to extend your stay at your own expense. Travel costs to and from Fairbanks. Lodging the night of July 9th. Some food on travel days. All food while in Fairbanks. While in Denali: Tent-cabins which sleep two to four people. Clean, double-sided, modern pit toilet. Potable running water (cold only) for cooking, brushing teeth, etc. No showers. No electricity. No cell service. 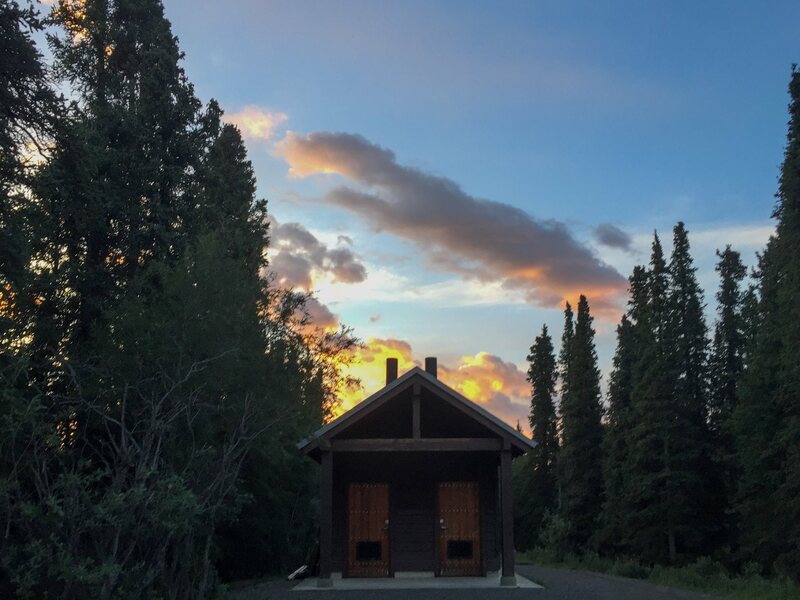 While at Coal Creek: Historical mining cabins with rustic beds and wood-burning stoves. Rustic double privy. Full (if somewhat historic) kitchen. Electricity in two buildings. VERY spotty and limited wifi (don't count on it working). Two showers with hot water (usually). No cell service. Washing machine for clothes. While in Fairbanks: Private college dorms. These are not particularly modern, but clean and secure. They will seem luxurious after the previous nine days. Communal bathrooms on each floor. Cell service and wifi. Food and coffee within walking distance. Communal washers and dryers. 2017 Participants study a map on the first morning outside the Fairbanks Airport. All participants arrive in Fairbanks. A standard array of lodging options are available including hotels, hostels, AirB&B, etc. Many have shuttles to and from the airport, but taxis and Uber/Lyft are also easy to use from this airport. 9:00 AM - Group meets for the first time near the baggage claim at the airport. Load up luggage into our van and drive to Denali National Park (about 2 hours). We will grab lunch at park entrance and also pick up light food for dinner. 1:00 PM - Orientation meeting at the Murie Science and Learning Center (MSLC). At this meeting you'll be assigned the instrumentation you'll be writing for (we draw them out of a hat). Before heading into the park, we will divide our luggage and leave all street clothes, computers, etc. in secure storage at the MSLC. It is smart to pack in such a way so as to make this fast and easy. Backcountry gear will be transferred to the MSLC van. Drive out to the Alaska Geographic Field Camp at the Teklanika River (we call it Tek Camp). This takes a little over an hour. In-camp orientation, and then some time for "nesting". Take a short hike around the area. Dinner (this will be a cold dinner of the food we all purchased earlier in the day). Coda - We usually have evening talks in the Yurt or around the campfire. 2015 Participants on a day-hike in Denali. Gear up for the day's outing. Depart camp in MSLC van and spend all day on excursions deep in the park. During our outings, we'll take time for lunch and also have creative time for contemplation and inspiration. Return to Tek Camp late in the afternoon. Caravan plane arrives at the gravel runway at Coal Creek Camp bringing the 2014 participants. Clean camp, pack, and depart. Drive out to MSLC and have brunch with park administrators (hopefully Chief of Interpretation or Superintendent). Retrieve luggage and switch back to FSAF van. Drive to Fairbanks (about two hours). This will be the first time you have cell service since you entered the park. Make a quick grocery store run to pick up dinner for later. 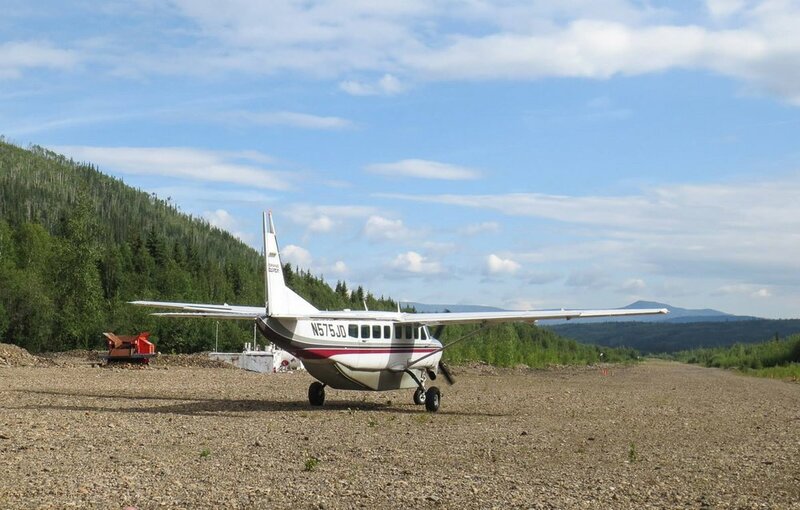 Fly by 10-seater bush plane to Coal Creek Mining Camp (on the Yukon River and a million miles from anything at all). You'll be taking all your belongings to Coal Creek. Orientation to the camp, then some time for "nesting". We'll all be eager to get into those showers. Start composing! Dinner will be whatever you bought earlier in the day. 2015 Participants working on their pieces in the mess hall at Coal Creek. Three full days of composing time. We have a quite space in one cabin that has power, and those who prefer to compose in a more social environment use the mess hall. Food will be abundant and varied. Occasional diversions for those who need a break include a tour of the gold dredge, spending the night at Slavens Road House, panning for gold, watching beavers, singing around the campfire, and (if we're lucky) boat rides on the Yukon River. These days are primarily for composing, though, so your time will mostly be unstructured, and we will forego some evening meetings. Clean cabins and pack to depart. Meet plane at runway and fly back to Fairbanks. Check into dorms at UAF. Get printer up and running. Everyone will have the opportunity to print their pieces out this evening. Assign rehearsal schedule for Friday. Dinner out (our first restaurant meal in nine days. 2014 composer Marc Evans has his first rehearsal. All composers get their first rehearsal with Corvus. This takes most of the day. We'll have dinner out together and probably attend some other FSAF concert event. Attend the World Eskimo-Indian Olympics. Visit the Morris Thompson Cultural Center. Generally relax after a very taxing 10 days of adventuring and composing. We'll all be basically joined at the hip by then. Oh yeah... we will definitely be eating falafel. Just make a mental note of it. Drive down to Denali National Park in the morning. Lunch at Morino Grill in park. 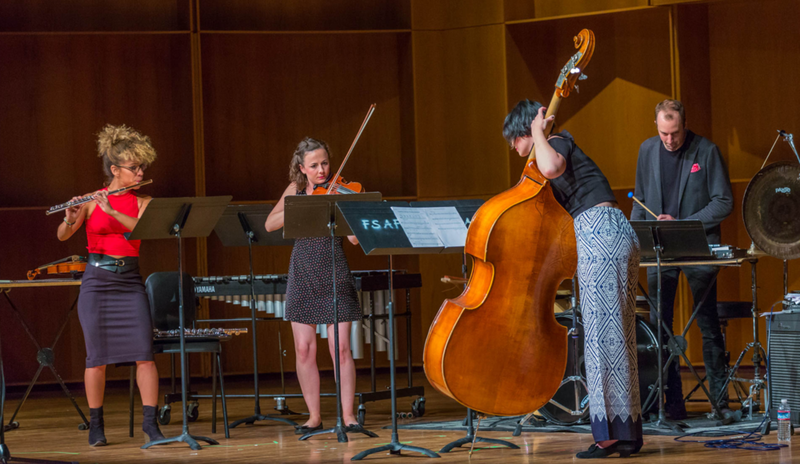 Attend Denali Music Festival events in afternoon. Evening premiere of all nine pieces in Denali Visitors Center. Very late drive back to Fairbanks. Free time or group activities during the day. Some packing, probably. Evening concert of all pieces in Fairbanks. Depending on how tired everyone is, we sometimes have a little pary/hang afterwards. Some people may opt to depart in the wee hours after this. You only need to be at the airport about 45 minutes before your flight, and MOST flights leave Fairbanks a little after midnight. You don't need to do this, though, since you have the dorms for one more night. People go to airport in groups. I'll shuttle you there as I'm able. 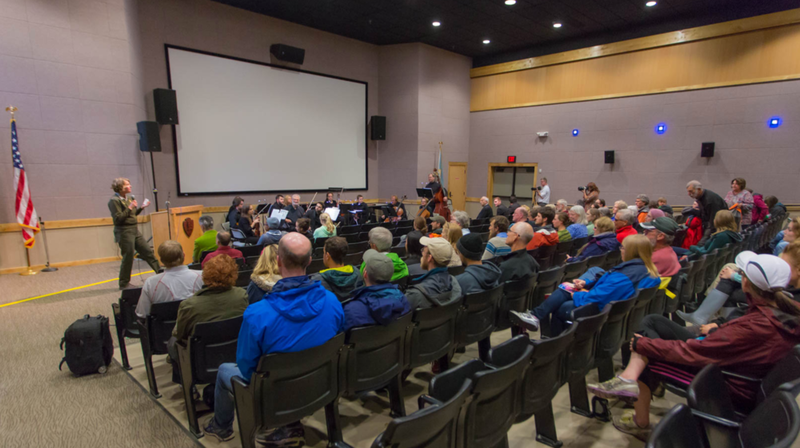 Chief of Interpretation Nancy Holman welcomes audience to composers' concert at the Denali Visitors Center. Corvus performing in Davis Hall on the campus of the University Alaska Fairbanks. The field portion of the seminar takes place outdoors and activities will continue, rain or shine. Weather conditions are unpredictable in Denali and Yukon Charley. You must be prepared for a wide range of conditions. Temperatures can vary from below freezing to 75 degrees Fahrenheit. Mosquitoes and other biting insects can be numerous anytime during the summer. Be prepared with adequate warm clothing, a hooded rain jacket, and rain pants. Dressing in layers is recommended. A video with instructions about clothing is provided here. More detailed information about individual items will be included on a packing list I'll provide soon..
Intrepid 2017 participants practicing good river-crossing technique. In spite of what the video says about various footwear, you need to bring heavy hiking boots that go above the ankle and are waterproof. Also bring a few sets of hiking socks. During the Fairbanks portion of the trip, street clothes are appropriate and you can consult temperature averages online. I recommend hiking with gaiters as well. Remember, there are no trails, so we hike through brush, muck, scree, and rivers. 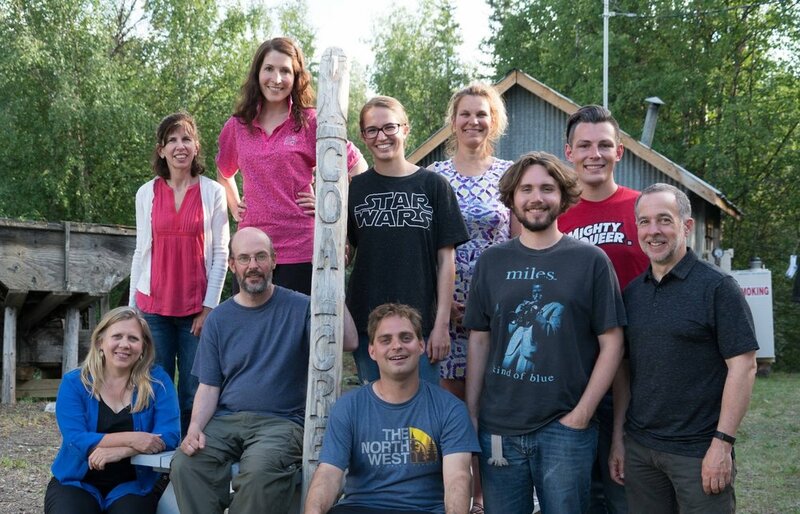 Because the wilderness experience is at the heart of this seminar, we ask that participants not bring their computers or tablets to the field camp at Denali. In addition to the lack of electricity and space, we find that the mental process of “unplugging” is impeded by the presence of computing devices. While at Denali, we will be working (some for the first time) with imagination, pencil, and paper only. Each participant will be provided with a complimentary spiral-bound notebook of staff paper for their use. One exception is, of course, sound recorders. If you have a field recording device you’d like to use to capture the soundscapes of the wild for inspiration, that is certainly encouraged. Of course, cameras are a must! If you've got good binoculars, bring them along, too! 2017 participants scramble to take pictures of one of our neighbors in the park. After we travel to Yukon Charley, our focus will move to composing and notating, so those who wish to use computers will be able to do so using the power available there. All participants are responsible for their own portable computers, software, and any needed accessories. Please choose the least bulky option possible in selecting what to bring. I will bring five or six small MIDI keyboards with me (Akai LPK25 in case you’re curious). I’ll also have one reference copy of current notation and orchestration books that you can all share. 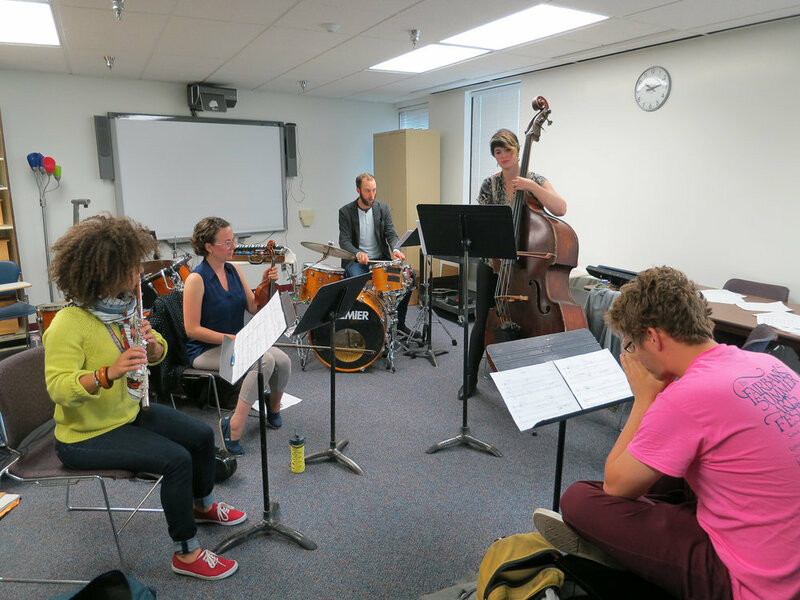 This field seminar is designed to foster creativity in composers of all levels as they relate their art to their surroundings and experiences in the wild. It is NOT a composition class. We will inevitably learn a lot from one another as we exchange ideas and discuss approaches, but no one will presume to “instruct” anyone on compositional style or approach unless invited to do so. Please don’t come with any music already composed. The whole essence of this field course is to allow the experience to shape and influence your creative process. It will be everyone’s responsibility to know their own work habits well enough to plan a piece that can be completed, rehearsed, and performed effectively in the short time allotted. You won’t find out about your instrumentation until our first meeting on July 12th. The performances will be recorded with the best audio technology available to the organizers and all participants will receive a copy of the recording. We have found from experience that it is unwise to try and include any audio playback under such conditions, so the works you will write must be acoustic. We do use projection during performances, and the images will be drawn from our experiences over the preceding week. 2014 participant Marc Evans was a big fan of the headnet. - Spiral-bound manuscript notebook. Like THIS. - Small personal-sized bottle of bug spray with high Deet content. 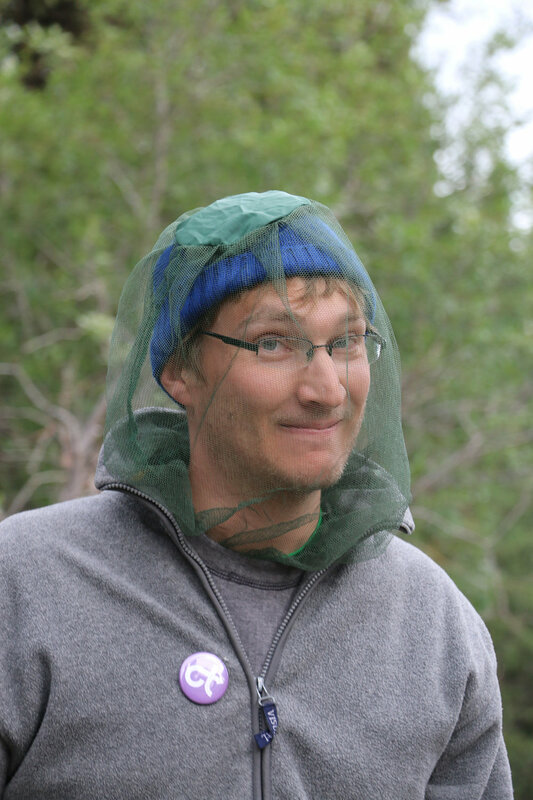 Mosquitoes in Alaska are epic. It differs from year to year and everyone's personal tolerance is different, BUT... it pays to be prepared. - Head net. Fits over a hat. When you need it, you REALLY need it. - Eye mask. Remember... it's light all the time. - Ear plugs. You're bunking with strangers. They snore. So do you. - A few other things. Probably a t-shirt. - Small MIDI keyboards for note input. - Notation books and orchestration books. - Field guides for birds, flowers, etc. - Binoculars. We'll have a few of these, but if you love your own, bring them! - Trekking poles. We'll have a few extra pairs. You're welcome to bring you own, though. - Bear spray (you'll get plenty of instructions on safety in bear country, but we'll always have these along with us). - Sleeping pad. The bunks at Denali have foam pads, and the beds at coal creek have normal mattresses. 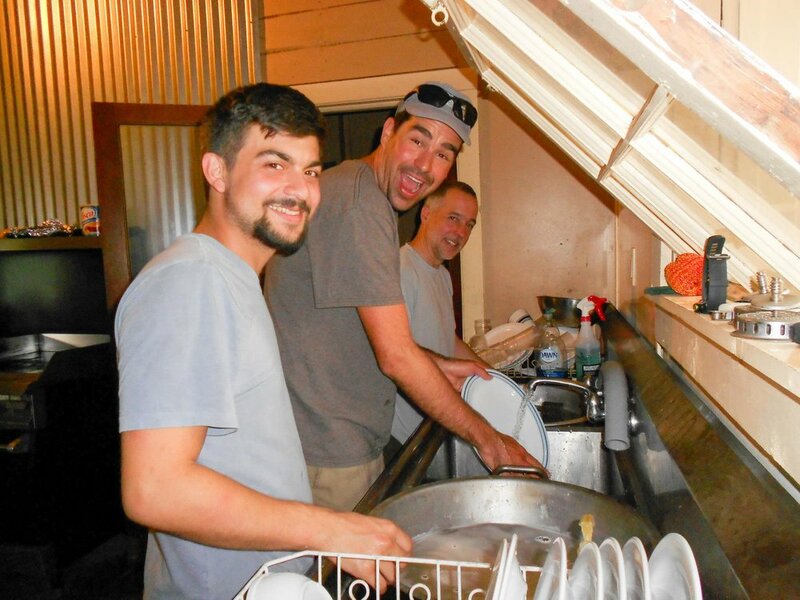 Cameron Dale, Cody Westheimer, and Stephen Lias wash the dishes at Coal Creek in 2015. Participants all pitch in to help our chefs with meal preparation and cleanup. As the time approaches, we'll provide you all with an easy packing list. We've got plenty of time for that, though. Yes! (Bearing in mind that you are choosing to come to a wild place with wild animals and steep mountains and have a creative adventure.) At all stages of this trip, you'll be accompanied by guides, leaders, scientists, and National Park employees whose job is to make sure you are safe. You'll be given some instruction on how to handle bear and moose encounters, and supplied with bear spray when appropriate. You wouldn't be interested if you didn't want an adventure, right? But we'll make sure this adventure isn't your last. The 2017 participants of Composing in the Wilderness on their last evening at Coal Creek.